Gluster is a distributed and scalable network file system developed in user space by FUSE (Filesystem in user space) to hook itself with VFS layer. It’s permit to scale to several petabytes handling thousands of clients. The gluster volumes are storage unit exportable formed by disk spaces called bricks distributed in different servers. The volumes data can be distributed or replicated. In the first case the files are distributed among the bricks of the volumes without redundancy; in the second case the files are distributed in all brick of the clusters. For all the details about how the volumes can be created, visit the gluster site. Gluster file system can be used as scalable storage for any type of data, In this tutorial I will explain how to create a gluster file system replicated formed by two nodes in geo replication with a remote site reachable by WAN. The data write between the nodes of master cluster is synchronous. Versus the remote node the write data is asynchronous. This solution is optimal for a remote site to use as disaster recovery if the primary site goes down. Before starting, I would like to make a introduction how the gluster architecture is implemented. 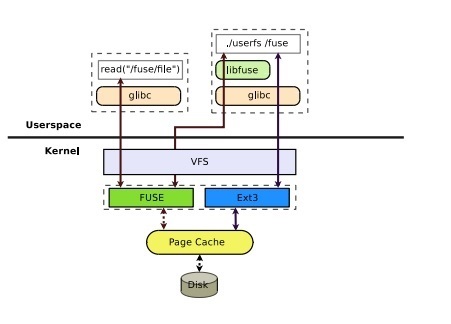 Gluster file system is a user space file system developed thanks to FUSE, a kernel module that support interaction between kernel VFS and non-privileged user applications and it has an API that can be accessed from userspace. Every system call caught by kernel virtual file system is redirect by /dev/fuse file descriptor via FUSE API to user space application that interacts directly with the underlyng file system (xfs, ext3, ext3 and ext4). It means that for any write/read to underlyng file system, there are two context switches (a switch from a application user to other) with significative impact respect a classic file system where there is only switch from application to kernel mode. A process read the /fuse/file belong to FUSE file system already mounted. fined in userfs for the read() operation. The request is managed in a application user space and is server for example reading from a ext3 file system by a normal system call. The ouput is returned to first application user. This architecture gives good speed for big data file, but slow perfomance for small files. For this reason, I would not use glusterfs for a critical web server (I infact experimented bad performance for serving small web pages) but it’s more adapted for big files as used in desktop computers, multimedia servers, and scientific computing. You can find more info about FUSE file system in this link: http://www.csl.sri.com/users/gehani/papers/SAC-2010.FUSE.pdf. In gluster the the basic unit of storage is called brick that is a an export directory on a server. A Volume is the collection of bricks spanned on different servers mountable by remote clients. The files can be distributed across various bricks in the volume, distributed configuration, or replicated across bricks in the volume, called replication. There are others way to configure a glusterfs cluster consultable at https://gluster.readthedocs.io/en/latest/Quick-Start-Guide/Architecture/#architecture. The files are replicated in all bricks of the cluster in syncronous way and in asyncronous way versus slave nodes of a remote cluster. This last solution is called geo replication and it’s the right solution for backup or disaster site. Let’s start now to speack about all the actions for the installation and configuration procedure in all nodes of two primary and secondary sites.Next I will detail the geo replication configuration. The goal of this my article is to show how to install and configure two gluster file systems sites in geo replication. The primary site is composed by two systems gfs-master-01 and gfs-master-02. The secondary remote site is composed by one only node gfs-remote-01. The file system that will be replicated by glusterfs servers must be created and mounted on all nodes. In every node I will create a logical volume called gfs belonging to logical group data that will mounted on all servers. Let’s describe now the steps for configuring the gluster slave on remote node. Before creating the volume in the master servers, it’s necessary to start the gfs servers. Now the volume is created without replica mode because in the remote site there is one only servcer. The remote volume is up&running. The final steps is to geo replicate the master with the slave site. The geo data replication between master and slave volume will be work is in asyncronous way and this is very useful because doesn’t slow down the data write in master site. A solution very adaptable for disaster or backup site. The connection from master to slave uses the ssh protocol, instead the synchronization happens from slave to master using the rsync. The ssh keys must be moved in the right directory of masters nodes. In the remote node the following link is created, otherwise the replication gives an errore because the gsyncd utility used for replication is not found. As you know, the replication is between the master volume that is replicated in synchronous way and the remote volume synchronized in asynchronous way. The remote volume could be another gluster cluster like the master, in my case is one single node. The thing to understand is that the geo replication is from master to slave, not from slave to master. In case of disaster, after that the master site is recovered, a manual approach must be performed for aligning the master site to slave updated during the disaster. The gluster file system is very useful and good alternative to nfs server and solutions like drbd that are more complicated to configure and manage. It’s a solution to use every time a file system distributed is requested or for disaster recovery sites. The advantages are related to slow performance for read/write of small files. This could give degrade performance for application that perform high value of input/output for seconds..
Don’t hesitate to contact me for any feed-back or suggestions.